Anthrax is caused by Bacillus anthracis that produce two exotoxins, lethal toxin and edema toxin. The lethal toxin is composed of the lethal factor (LF) complexed with the cell binding protective antigen (PA83, 83 kDa). Likewise, the edema factor (EF) binds to the PA83 to form the edema toxin. Once PA83 is bound to the host cell surface, a furin-like protease cleaves the full-length, inactive protein into 63 kDa and 20 kDa antigens (PA63 and PA20). PA63 forms a heptamer and is internalized via receptor mediated endocytosis forming a protease-stable pore, which allows EF and LF to enter the cell and exert their toxic effects. Both proteolytically cleaved protective antigens (PA63 and PA20 fragments) are found in the blood of infected animals. The 63 kDa protective antigen PA63 fragment has been thoroughly studied while little is known about the PA20. In this study we examined the role of PA20 using high throughput gene expression analysis of human peripheral blood mononuclear cells (PBMC) exposed to the PA20. We constructed a PA mutant in which a Factor Xa proteolytic recognition site was genetically engineered into the protective antigen PA83 to obtain PA20 using limited digestion of this recombinant PA83 with trypsin. Global gene expression response studies indicated modulation of various immune functions and showed gene patterns indicative of apoptosis via the Fas pathway in a subset of the lymphoid cells. This finding was extended to include observations of increased Caspase-3 enzymatic activity and the identification of increases in the population of apoptotic, but not necrotic cells, based on differential staining methods. We identified a list of ~40 inflammatory mediators and heat-shock proteins that were altered similarly upon exposure of PBMC to either rPA20 or B. anthracis spores/vegetative cells. This study shows that the PA20 has an effect on human peripheral blood leukocytes and can induce apoptosis in the absence of other PA components. Bacillus anthracis, the etiologic agent of anthrax, possesses three primary, plasmid-encoded, virulence factors: lethal and edema Toxins encoded by the pXO1 plasmid [1, 2] and a poly-γ-D-glutamic acid capsule, encoded by the pXO2 plasmid . Lethal toxin is composed of lethal factor (LF, 90.5 kDa) , a Zn+2 dependent metalloprotease which cleaves several members of the mitogen activated protein kinase kinase (MAPKK) family [4–7] and, in complex with protective antigen (PA, 63 kDa referred to as PA63), is responsible for the lethal action of anthrax toxin. Similarly, edema toxin is composed of PA63 in combination with edema factor (EF, 88.8 kDa), a calmodulin-dependent adenylate cyclase that elevates host target cell intracellular cyclic AMP levels causing deregulation of cellular physiology and edema . Protective antigen is secreted by the organism as an 82.7-kDa protein referred to as PA83  and only binds LF or EF when activated by protease cleavage to form PA63 . In a model based on studies in cell culture, PA83 binds to ubiquitous host cell membrane receptors  and is cleaved by a cell-associated furin type protease [12, 13] to form PA63, which then oligomerizes with other PA63 molecules to form an heptamer. The heptamer forms a prepore structure to which LF or EF bind to form lethal toxin or edema toxin, respectively . It has generally been assumed that the 20 kDa remainder of the PA83 molecule following cleavage serves no function. Once formed, the complex is translocated into the target host cell where LF and EF exert their toxic effects [14, 15]. In contrast to this widely held cell culture model, no PA83 has been demonstrated in the peripheral blood of infected animals, but only PA63 complexed with LF, and possibly EF, was found thereby supporting the model that the PA63/LF complex is pre-formed before binding to the target cell [16, 17]. Serum protease activity has been reported that rapidly cleaves PA83 to form PA63 and rPA20. This activity is heat labile at 56°C, requires calcium, and occurs in a broad variety of animals, including primates, horses, bovines, guinea pigs, rabbits, and chickens [16, 17]. Our objective was to determine if rPA20 has activity on human peripheral blood leukocytes and obtain information as to which type of leukocytes was being affected. Note: Studies were conducted initially with the commercially prepared 20 kDa fragment of PA, from LIST Biological Laboratories, Inc., which required purification to remove minor amounts of contaminating PA63. It is important to preface this report by stating that after a few studies were conducted with the purified PA63 free material it was determined that the commercially obtained product was actually 17 kDa rather than 20 kDa. Therefore, we prepared a recombinant (r) PA20 that lacked the trypsin cleavage site that would produce PA17. Upon trypsin cleavage, the resultant rPA20 was purified and used in all subsequent studies. However, similar data were obtained using the List preparation PA17 and in-house rPA20 for the global microarray studies. All subsequent studies were carried out using only rPA20. Note: microarray data have been submitted to the Gene Expression Omnibus (GEO) and can be searched using the Platform ID: GPL3033, Series:GSE12533. Commercially obtained 20 kDa fragment of PA, (LIST Biological Laboratories, Inc, Campbell, CA) is now referred to as PA17. It contained trace amounts of PA63 and removal of this contamination was achieved by immunoaffinity chromatography. In this procedure the monoclonal antibody BA-PA2II-14B7-1-1 (1 ml of ascites fluid), was immobilized using an ImmunoPure™ Protein G IgG Orientation Kit (Pierce) as instructed by the manufacturer. This antibody recognizes the 63 kDa receptor binding region (C-terminus) of the PA molecule . PA17 kDa N-terminal fragment (LIST Biological Laboratories, Inc.; sold as PA20), 500 μl containing 250 μg of protein, was diluted with an equal volume of PBS (pH 7.3, Sigma, St. Louis, MO). The resulting 1 ml was combined with 1 ml of immobilized antibody and incubated at room temperature on a rotator for 2 hours. The suspension was then centrifuged at 3000 × g for 5 minutes to recover PA17 in the supernatant fraction, filtered through a 0.2 μm cellulose acetate low protein binding filter (Corning, Lowell, MA) and frozen in aliquots at -70°C. Proteins were analyzed by SDS PAGE using 4–15% PhastGels (Amersham, Piscataway, NJ) and Western Blot as previously described . The amino-terminal domain of PA is cleaved at the consensus R164–K165–K166–R167 sequence recognized by furin-like proteases in-vitro  and by a plasma protease in vivo . This process results in the release of a 20-kDa amino-terminal fragment (PA20) and the formation of 63-kDa carboxy-terminal fragment heptamers . Lethal factor (LF) and/or edema factor (EF) then bind to the heptamers and these toxic complexes are internalized via receptor-mediated endocytosis into eukaryotic cells . Limited digestion of PA with trypsin results in 63 kDa and 20 kDa fragments. These fragments were isolated and fully characterized by Christensen et al. . However, prolonged digestion with trypsin results in a trypsin resistant 17 kDa amino terminal fragment. Deletion of the consensus R164–K165–K166–R167 sequence eliminates the cleavage of PA by furin-like proteases and by trypsin . In-vivo proteolysis of PA results in 63 kDa and 20 kDa fragments ; therefore we wished to be able to produce an identical and stable 20 kDa fragment in-vitro. In this study, we performed mutagenesis of the trypsin cleavage site in PA83 to make it sensitive to cleavage by Factor Xa protease because there are no other Factor Xa sensitive sites on the PA83 sequence. We constructed a PA mutant in which a Factor Xa proteolytic recognition site (IEGR) was genetically engineered into PA . The Factor Xa proteolytic site was introduced into PA at the trypsin-sensitive site by a 2-step mutagenesis procedure using a Muta-Gene Phagemid InVitro Mutagenesis kit (BioRad, Hercules, CA). A 2,044 bp HindIII/BamHI fragment encoding the carboxy-teminus of pag, including amino acid residues 164–167 which comprise the trypsin-sensitive site, was inserted into pBluescriptSK (Stratagene, La Jolla, CA.) and designated pPAHB. Oligonucleotide XaFN (5'-GTACTTCGCTTTTCTATTGAGTTCGAAG-3') was used to convert the wild-type pag gene fragment in pPAHB to an R164I/K165E double mutant designated pPAHB(XaFN). Oligonucleotide Xa2FN1 (5'-GTACTTCGCCCTTCTATTGAGTTCGAAG-3') was used to convert the pag double mutant in pPAHB(XaFN) to K166G to complete the creation of the Factor Xa site and was designated pPAHB(Xa2FN1). 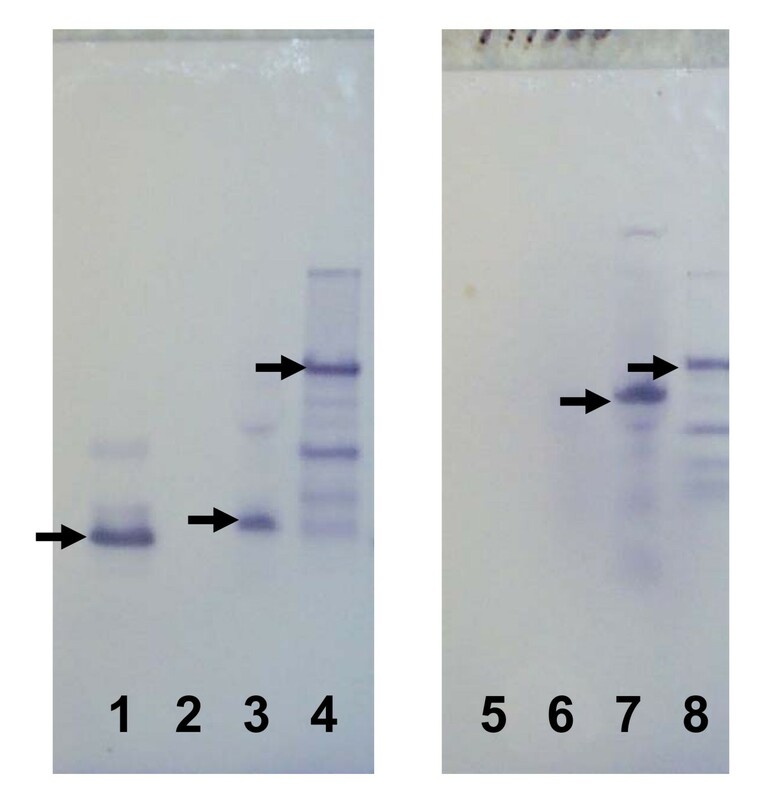 A 670 bp PstI/HindIII fragment from pPAHB(Xa2FN1) containing the Factor Xa site codons was ligated into pYS5 similarly digested with PstI/HindIII to remove the wild type 670 bp fragment and the resulting plasmid was designated pYS1Xa2FN1 . pYS1Xa2FN1 was transformed into Bacillus subtilis WB600 for expression of the PA/Factor Xa mutant . PA/Factor Xa was purified from WB600 PYS1Xa2FN1 as previously described for rPA . Leukopheresis units were obtained from volunteer donors using the procedures outlined in our approved human use protocol, reviewed by the established Institutional Review Board at WRAIR. The written informed consent document was provided to the volunteers in advance of the procedure. We obtained PBMC (4 different individuals over a period of ~6 months, collected from ~8–10 AM to minimize variability) from healthy human male volunteers who had been screened to be HIV and Hepatitis B negative and were from 19–61 years of age. rPA20 was added to newly plated cells in flasks for the time period specified. Cells incubated in the absence and presence of rPA20 were collected by centrifugation at the specified exposure time. Spores were prepared from B. anthracis Ames strain (pXO1+, pXO2+). Briefly, 5% sheep blood agar (SBA) plates were inoculated with B. anthracis Ames spores and incubated overnight at 35°C. Several isolated colonies were transferred to a sterile screw capped tube containing 5 ml of sterile PBS. NSM Petri plates (New sporulation medium: per liter added Tryptone; 3 g, Yeast extract; 3 g, Agar; 2 g, Lab Lemco agar; 23 g, and 1 ml of 1% MnCl2·4H2O) were inoculated with 200 μl of the prepared cell suspension. The plates were incubated for 48 hrs at 35°C and checked for sporulation progress by microscopic examination. Continued incubation at room temperature was performed until free refractive spores constituted 90–99% of total suspension. Spores were then harvested from plates using 5 ml of sterile water. Spores were washed 4 times in sterile water and checked for purity by plating 10 μl in triplicate onto 5% SBA plates and incubating overnight @ 35°C. Enumerations of spores were calculated via CFU/ml (determination of viable spores) and also for actual spores/ml using Petroff Hauser chamber. An ELISA kit for TNF-α was used to determine TNF-α levels in PBMC cells treated with rPA20 according to manufacturer's instructions (Quantikine R&D systems, Minneapolis, MN). The amount of protein was quantified using Ceres UV 900-Hdi plate reader (Bio-Tek Instruments Inc., Winooski, VT). Total RNA was isolated from cells using the TRIzol™ reagent (Invitrogen, Carlsbad, CA) according to the manufacturer's instructions. The RNA samples were treated with DNase-1 to remove genomic DNA and were re-precipitated with isopropanol. The quality of the RNA to be used for microarray was characterized using a 2000 BioAnalyzer (Agilent, Santa Clara, CA) to verify the presence of 18 and 28S bands, to confirm the lack of degradation. RNA quantity was determined using a Nanodrop spectrophotometer. Preparation of Microarray Chip: Human cDNA microarrays were generated using sequence verified PCR elements including the approximate 6900 well-characterized human genes from The Easy to Spot Human UniGEM V2.0 cDNA (Incyte Genomics, Inc). The PCR products ranging from 500–700 base pairs were deposited in 3X saline sodium citrate (SSC) at an average concentration of 165 μg/μl on CMT-GAPS II aminopropyl silane-coated slides (Corning, Corning, NY) using a VersArray microarryer (Bio-Rad, Inc). The arrays were post processed by UV-cross linking at 1200 mjoules, baking for 4 hours at 80°C, and then the positively charged amine groups on slide surface were inactivated through reacting with succinic anhydride/N-methyl-2-pyrrolidinone. Upon hybridization, the quality of each microarray, i.e. the efficiency of reverse transcription (RT) reactions, labeling competence etc. was assessed. Microarray labeling was performed using Micromax Tyramide Signal Amplification (TSA) Labeling and Detection Kit (Perkin Elmer, Inc., MA). The slides were hybridized for 16 h at 60°C. The GenePix Pro 4000b (Axon Instruments, Inc., CA) optical scanner was used to scan the hybridized slides and the raw intensity was recorded through the Gene Pix 4000 software package (Axon Instruments, Inc., CA). Intensity of the scanned images was digitalized through Genepix 4.0 software. Microarray images were visualized using Imagene v.6 (BioDiscovery, Inc., El Segundo, CA) and data were analyzed using GeneSpring V. 7.1 (Agilent, Santa Clara, CA) and Partek Pro. V. 5.0 (Partek, St Louis, MI). Data cleansing and normalization: Using ImaGene (BioDiscovery Inc), background and foreground pixels of each spot were segmented and the highest and lowest 2% of the probe intensity was discarded. Local background correction was applied to each individual spot. The genes that passed this filter in all given experiments were selected for further study. Data cleansing and statistical analysis was carried out using GeneSpring® 7.1 (Agilent Tech., CA). Local background was subtracted from individual spot intensity. Genes that failed this 'background check' in any of the experiments were eliminated from further analysis. Each chip was next subjected to intra-chip normalization (LOWESS). The genes that varied most between control and treated sample sets were selected via t-test analysis. The p-value cutoff was set at 0.05. We used the reference design, where a reference RNA sample is co-hybridized with each sample on the slide. This design allows us to normalize between slides for variations that can be due to hybridization, transcription and labeling efficiencies (technical variations). PBMC were treated with rPA20 for 24 h. Cells were stained with Hoechst 33258 dye for 30 min and examined by fluorescence microscopy. Cells having bright; fragmented and condensed nuclei were identified as apoptotic cells. The number of apoptotic cells was counted in 10 microscopic fields (×40) in each case. Caspase activity in PBMC cells exposed to LIST PA17 and to rPA20 was studied using the EnzChek® Caspase-3 Assay Kit #2 (Invitrogen, Carlsbad, CA). Cells were harvested after 24 hrs of exposure to rPA20 and washed in PBS. Cells were lysed and centrifuged. The Z-DEVD-R110 substrate solution was added to each of the treated and control samples. The mixture was incubated for 30 min and the fluorescence was measured at excitation/emission ~496/520 nm. Peripheral blood mononuclear cells were incubated with rPA20 for 16 hours. Cells were then washed twice with PBS and labeled with allophycocyanin (APC)-conjugated mouse anti-human CD38 monoclonal antibody (Becton Dickinson Biosciences, Franklin Lakes, NJ), followed by incubation on ice for 30 min in the dark. The cells were then washed and resuspended at 2 × 106 cells/ml in cell buffer (cell assay reagents, Agilent Technologies, Palo Alto, CA). A cell assay LabChip (Agilent Technologies) was primed with priming solution (Agilent Technologies), after which 10 μl of the cell suspension (20,000 cells) was added to one of six channels. A focusing dye was applied to another chamber, which acted as a reference for the optical detection system. The chip was then placed in an Agilent Technologies Model 2100 bioanalyzer and fluorescence from the cells was measured. Fluorescent events were plotted against the fluorescent intensity (frequency histogram). Subsequent to portions of this investigation, it was noted in other studies that the PA fragment obtained from LIST Biologicals, Inc., appeared smaller on Western blots than PA20 detected in blood of infected animals (Figure 1). As can be seen in lane 1 the purported 20 kDa PA from LIST was smaller than the PA20 from infected animals (lane 3). To address this disparity in size, Dr. Harry Hines and his staff in the Toxinology Division, USAMRIID, performed electrospray mass spectrometry on the commercially obtained PA17. It was determined that the size of the protein moiety was 17 kDa rather than 20 kDa. Upon this discovery, an alternative source of PA20 was generated through recombinant DNA methodology as described in the following section. SDS-PAGE Western blot of anthrax infected rabbit plasma showing PA 20 and PA 63 just prior to death. Lanes 1 to 4 were stained with anti-PA20 specific MAb and lanes 5 to 8 stained with anti – PA63 specific MAb. Lanes 1 (arrow points to PA17) and 5 were loaded with the LIST PA17 at 5 mg/ml. Lanes 2 and 6 were left blank to minimize cross contamination. Lanes 3 (arrow points to PA20) and 7 (arrow points to PA63) were loaded with 1:20 dilution of plasma from Ames strain challenged rabbit #41 just prior to death. Lanes 4 (arrow points to PA83) and 8 (arrow points to PA83) were loaded with purified PA83 @ 10 mg/ml. The two furin-like protease or trypsin cleavage sites in PA result in a 20 kDa fragment that subsequently is reduced to 17 kDa. In order to prevent that from occurring, the sequence R164–R167 was changed from RKKR to IEGR as described in materials and methods. Deletion of the consensus R164–K165–K166–R167 sequence was shown previously to eliminate the cleavage of PA by furin-like proteases and by trypsin . The purified protein was digested with Factor Xa protease (Figure 2). SDS PAGE and N-terminal sequence analysis confirmed that the 63-kDa and 20 kDa fragments produced were identical to the fragments produced from wild type PA by limited trypsin digestion (not shown). SDS-Page analysis of the 83 and the PA 63 and PA 20 fragments. PA/Factor Xa was purified from WB600 PYS1Xa2FN1 (Lane 1). The purified protein was digested with Factor Xa protease (Lane 2) resulting in PA63 and PA20 fragments; Wild type control PA83 treated with Factor Xa protease did not result in PA fragments (Lane 3). Purified 83 kDa rPA was treated for 30 min at 37°C with bovine plasma Factor Xa (Pierce) resulting in PA 20 and 63 kDa fragments. LF was added and allowed to oligomerize with the PA63 at room temperature for 15 minutes. The mixture was applied to Superose 6 size exclusion column (Amersham-Pharmacia) in PBS and resulted in 3 peaks. The proteins in each peak were identified by SDS PAGE and Western blot. The first peak contained PA63 and LF, the second peak contained LF and the third peak contained rPA20. The rPA20 peak was further purified by Immunoaffinity to be certain that the rPA20 would not contain any residual PA63 as follows. The monoclonal antibody BA-PA2II-14B7-1-1 (1 ml of ascites fluid) which recognizes the receptor binding region (C-terminus) of the PA molecule was immobilized using an ImmunoPure™ Protein G IgG Orientation Kit (Pierce) as instructed by the manufacturer . 200 μg of rPA20 kDa (n-terminal PA fragment purified by the Superose exclusion column above) was combined with 1 ml of immobilized antibody and incubated at room temperature on a rotator for 2 hours. The suspension was then centrifuged at 3000 × g for 5 minutes to recover the rPA20 containing supernatant fraction. 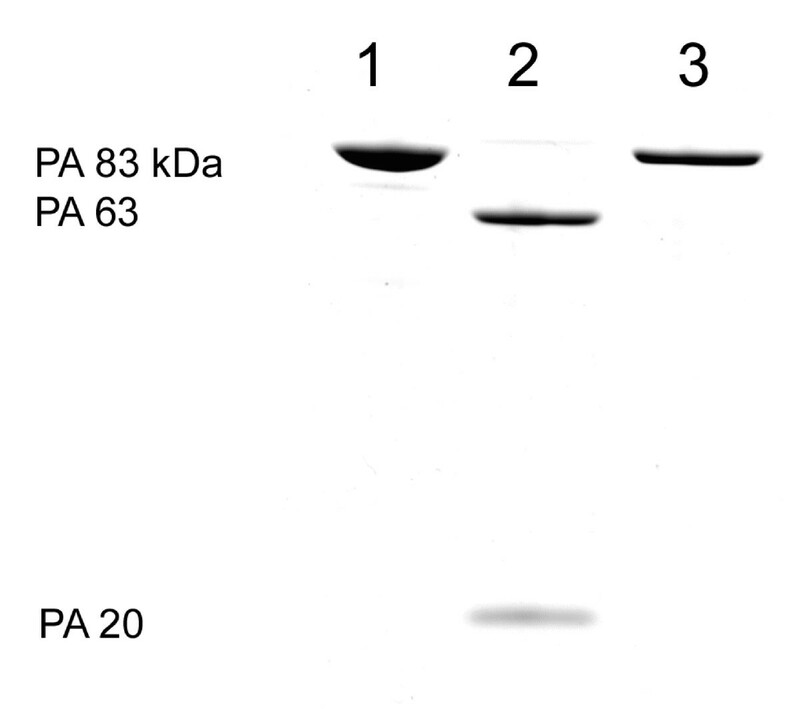 The purified rPA20 was compared to the LIST PA17 by SDS PAGE using 4–15% PhastGels (Amersham) (Figure 3). 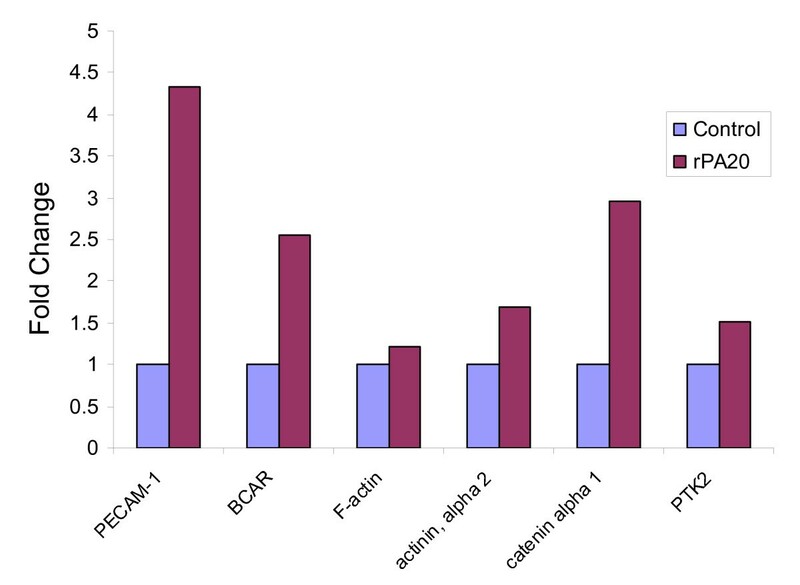 Western blot comparison of recombinant PA 20 from the PA/Factor Xa mutant (lanes 1–4) and the commercial PA 17 (lanes 5–7) product at quantities varying from 1 to 5 μg of the purified rPA 20 Factor Xa and the LIST PA 17 . Purified 83 kDa PA/Factor Xa was treated for 30 min at 37°C with bovine plasma Factor Xa resulting in PA20 and PA63 kDa fragments. LF was added and allowed to oligomerize with the PA63 at room temperature for 15 minutes. The mixture was applied to Superose 6 size exclusion column (Amersham-Pharmacia) in PBS and resulted in 3 peaks. The rPA20 was further purified by Immuno-affinity. PBMC samples obtained from 4 healthy individuals were incubated with 2 μg/ml of the rPA20 for 4 hrs. Microarray experiments were carried out using custom made cDNA chips. The RNA quality was characterized beforehand using a BioAnalyzer 2000 (Agilent, CA). Upon hybridization, the quality of each microarray, i.e. the efficiency of reverse transcription (RT) reaction, labeling competence, were assessed using RNA spikes (Invitrogen, CA). Inter-chip and intra-chip data normalizations were computed, as described in the Materials and Methods, using GeneSpring Software (Silicon Genetics, CA). One-way ANOVA with a p-value < 0.05 was applied to identify genes differentially regulated by rPA20. 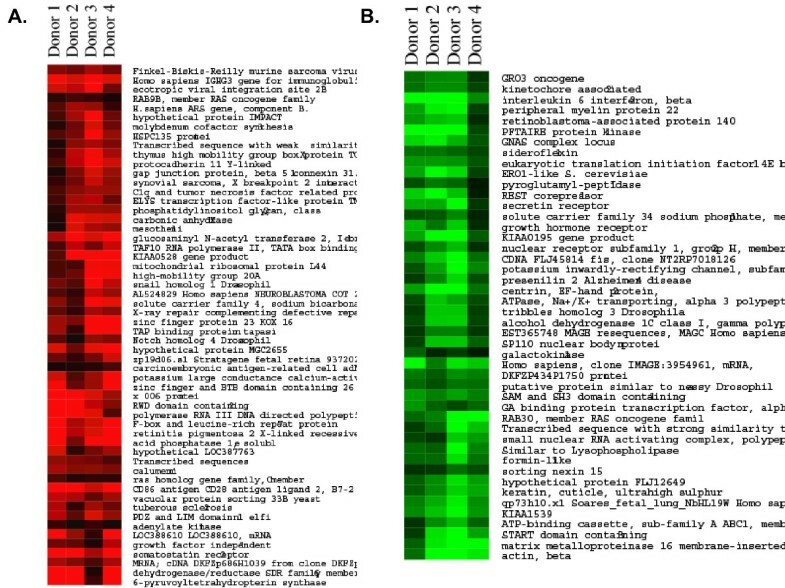 Figures 4a and 4b are cluster views of gene expression profiles in PBMC cells obtained from four donors and exposed to rPA20. Pseudo color cluster view of up regulated (a) and down regulated genes (b) in PBMC in response to 2 μg/ml the rPA 20 . Cells were obtained from 4 different donors and were treated with the rPA20. RNA was isolated and hybridized on the cDNA microarray slides as detailed in Materials and Methods. Images were analyzed using GenePix 4.0 and data were analyzed using GeneSpring 7.0. The expression data for these genes are listed in table 1. These genes were identified, using ANOVA t-test with a p < 0.05, to be highly significantly regulated when compared to the control untreated cells. H. sapiens ARS gene, component B. Transcribed sequence with weak similarity to protein sp:P39193 (H.
To confirm that the results observed in PBMC cells exposed to rPA20 were effects specific to rPA20, we denatured rPA20 by heating the peptide at 95°C for 10 min before adding it to the cells. Equal amounts (2 μg/ml) of the native and the denatured peptides were added to the cells and global gene expression analyses were carried out to compare the effect of native and denatured rPA20 on PBMC cells (Figure 5a). We found minimal variation in gene expression profiles in PBMC cell exposed to rPA20 when compared with the control untreated PBMC (Figure 5b). A. Cluster view of gene expression profiles in PBMC exposed to 2 μg/ml native and denatured rPA 20 compared to the control untreated. The peptide was heat denatured at 95°C for 15 min. prior to adding it to the cells. Equal amounts of the native and denatured peptides were added to the cells and incubated for 4 hrs. Data were normalized to the control untreated cells. B. Expression levels of TNF-α in PBMC cells exposed to the native and denatured rPA20. Cells were incubated with 2 μg/ml of the two peptides separately and the expression of TNF-α was examined using ELISA. We also studied the expression of TNF-α using ELISA in PBMC cells exposed to the native and denatured rPA20 and found no significant change in the expression of TNF-α in cells exposed to heat denatured rPA20. However, an increase in the expression of TNF-α was observed in cells treated with the native rPA20 peptide (Figure 5b). The gene expression profiles of PBMC cells exposed to rPA20 were compared with those obtained from PBMC exposed to B. anthracis at the same time points. We found that a significant number of genes were similarly regulated in rPA20 exposed cells when compared to cells exposed to the full pathogen (Figure 6). 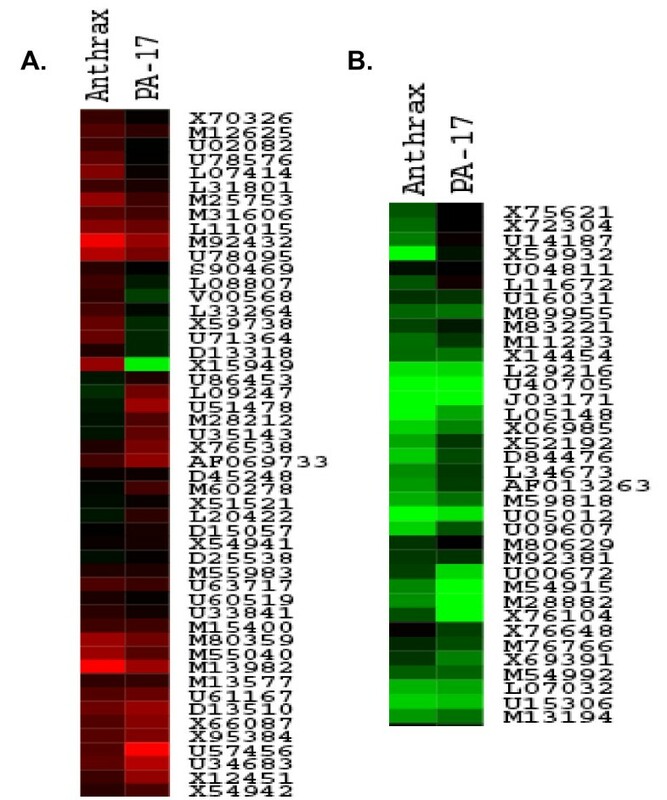 Cluster analysis of the gene expression profiles of PBMC cells exposed to rPA 20 compared with those obtained from PBMC exposed to B. anthracis for 4 hrs. RNA samples were isolated and hybridized on the cDNA micorarray slides as detailed in materials and methods. Images were analyzed using GenePix 4.0 and data were analyzed using GeneSpring 7.0 to identify up regulated (6a) and down regulated genes (6b). We applied ANOVA to identify the statistically significant genes that were altered with a p-value < 0.05 within the control and treated samples. Of the genes that were significantly up regulated by rPA20 in PBMC, we identified genes involved in cell adhesion, cell apoptosis, signaling and immune and inflammatory responses. Cytokine related genes were also regulated by rPA20. 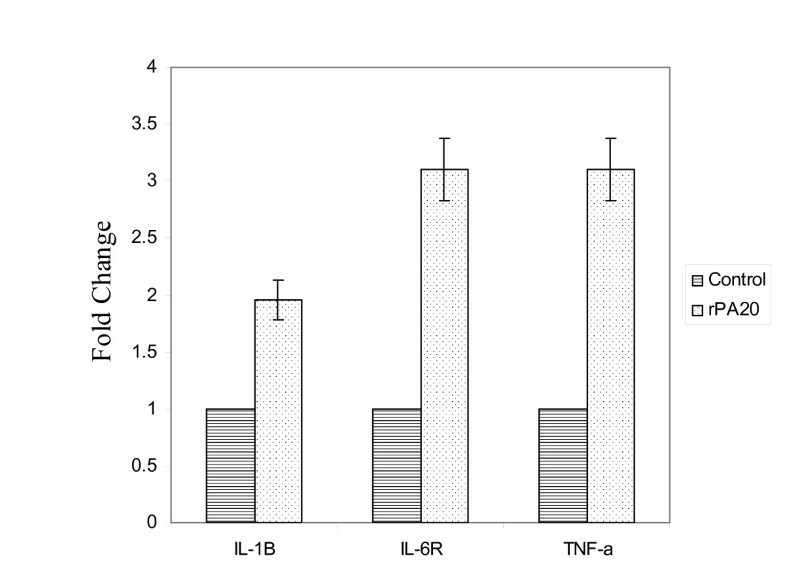 TNF-α, IL-1B, and IL-6 receptor were highly up regulated in PBMC treated with rPA20 (Figure 7). Expression profiles of IL-1β, IL-6R and TNF-α in response to rPA 20 in PBMC. Cells were incubated with the rPA20 for 4 hrs. RNA samples were isolated and hybridized on the cDNA micorarray slides as detailed in materials and methods. Images were analyzed using GenePix 4.0 and data were analyzed using GeneSpring 7.0. We used GeneCite software, a high throughput pathway analysis tool developed by our group, to identify pathways regulated by PA17 in PBMC . A dramatic finding was that components of the cell adhesion pathway were up regulated by rPA20 in PBMC (Figure 8). Expression profile of genes related to the cell adhesion pathway that were up regulated by rPA 20 in PBMC. Cells were incubated with the rPA20 for 4 hrs. RNA samples were isolated and hybridized on the cDNA micorarray slides as detailed in materials and methods. Images were analyzed using GenePix 4.0 and data were analyzed using GeneSpring 7.0. Data were then analyzed using GeneCite to identify pathways regulated by the rPA20. These genes are platelet/endothelial cell adhesion molecule 1 (PECAM1), breast cancer anti-estrogen resistance (BCAR), capping protein (actin filament) muscle Z-line, alpha 1 (F-actin), actinin, alpha 2, catenin alpha and PTK2 protein tyrosine kinase 2 (PTK2). Another pathway found to be regulated was the Fas pathway. Figure 9 illustrates expression patterns of some of these components in cells treated with rPA20. 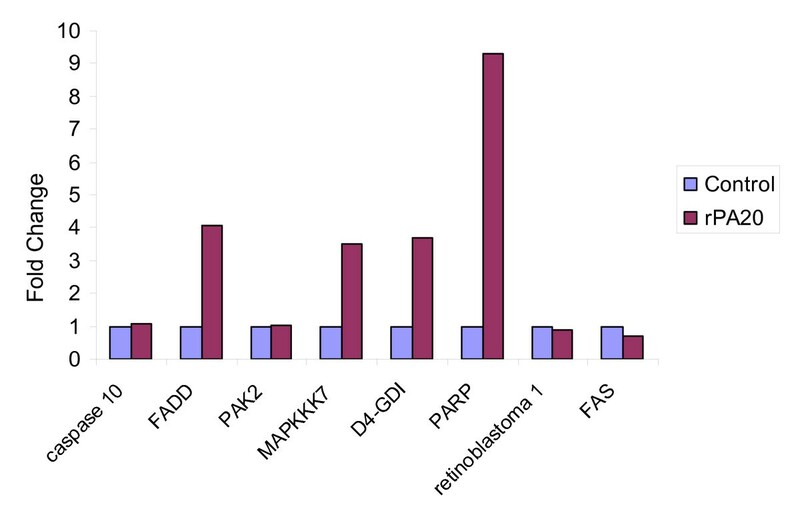 Expression profile of genes related to the Fas pathway that were regulated by rPA 20 in PBMC. Cells were incubated with the rPA20 for 4 hrs. RNA samples were isolated and hybridized on the cDNA micorarray slides as detailed in materials and methods. Images were analyzed using GenePix 4.0 and data were analyzed using GeneSpring 7.0. Data were then analyzed using GeneCite to identify pathways regulated by the rPA20. These genes are caspase 10, Fas (TNFRSF6)-associated via death domain (FADD), p21 (CDKN1A)-activated kinase 2 (PAK2), mitogen-activated protein kinase kinase kinase 7 (MAPKKK7), Rho GDP dissociation inhibitor (GDI) alpha (D4-GDI), ADP-ribosyltransferase (NAD+; poly (ADP-ribose) polymerase), retinoblastoma 1 and tumor necrosis factor receptor superfamily, member 6 (FAS). PBMC cells were stained with the DNA binding dye Hoechst 33258 to determine the number of apoptotic cells. 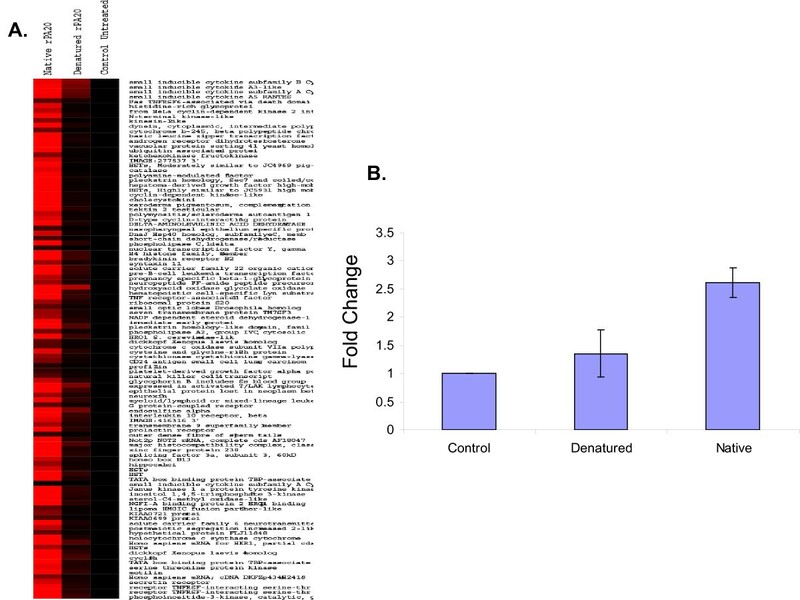 When PBMC cells were incubated with rPA20 for 24 hours, the percentage of apoptotic cells was increased by more than 5-fold with respect to control cells (Figure 10). Similar effects were observed in cells incubated with the PA17 peptide. We have also studied the effect of PA17 and rPA20 on the caspase activity and found increased enzymatic activity of Caspase 3 in PBMC that were exposed to PA17 and rPA20 (Figure 11). Induction of apoptosis in PBMC with rPA 20 . Cells were incubated with the rPA20 for 24 hours. Cells were then stained with HOECHST 33258 dye for 15 minutes. Cells with bright, fragmented, condensed nuclei were identified as apoptotic cells. This experiment was conducted at least 4 times (representative field shown here). LIST PA 17 and rPA 20 induce Caspase 3 enzymatic activity in PBMC. 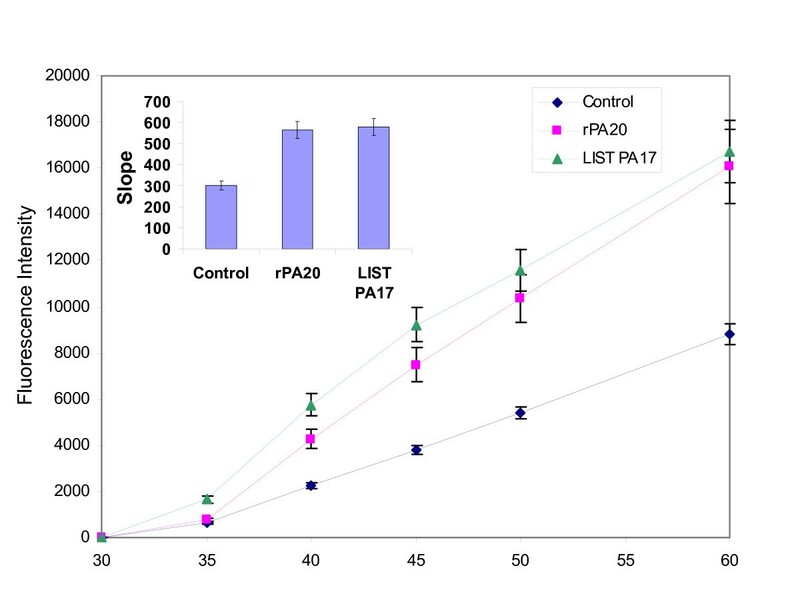 Cells were exposed to LIST PA17 and to rPA20 separately and harvested at indicated time points. Cells were lysed and centrifuged. The mixture was incubated for 30 min and the fluorescence was measured using excitation/emission ~496/520 nm. Microarray data analysis showed that CD38 transcription level was significantly down regulated in PBMC treated with rPA20. We carried out an antibody staining analysis of CD38 using the cell chip assay on the Bioanalyzer 2100 and found a decrease in CD38-associated fluorescence (Figure 12). Effect of rPA 20 on the expression of CD38 in PBMCs: Cells were incubated with rPA20 for 16 hours. Cells were then centrifuged and incubated with allophycocyanin (APC)-conjugated mouse anti-human CD38 monoclonal antibody. Samples were loaded onto a cell chip which determined cell associated fluorescence. Data are expressed as percent of CD38 fluorescent cell compared to total cell number (+/- standard deviation) and represent the results of three separate experiments performed in triplicate. It is widely accepted that B. anthracis toxins contribute to anthrax pathogenesis and to date, only the combination of the PA63 fragment in association with LF or EF have been described. PA is secreted by the bacterium as an 83 kDa protein which is rapidly cleaved in sera to PA63 and a remaining 20 kDa fragment. PA63 has been shown to form a heptamer that binds LF and forms a cellular pore via receptor mediated endocytosis to facilitate the entry of LF or EF into the host target cells. We have detected PA20 in the blood of infected animals, and to date no activity has been described for this PA fragment. In addition, PA83 has not been detected in the blood of B. anthracis infected animals. We have previously reported that PA83 is cleaved by a calcium dependent plasma protease to PA63 which forms oligomeric complexes with other PA63 and LF (and possibly EF), to result in the respective anthrax toxins . Although the 20 kDa fragment of PA is commercially available (LIST Biologicals), our recent studies showed that the procedure used resulted in a trypsin resistant 17 rather than a 20 kDa fragment (mass spectroscopy analysis). In contrast, in vivo, the fragment produced is 20 kDa. Although we used the rPA20 for the studies reported here, we showed that the PA17 has similar activities to the rPA20 on PBMC. To understand the role that PA20 plays in the pathogenesis of B. anthracis, we carried out a global genomic analysis of the effect of rPA20 on PBMC in vitro. Some of the genes found to be regulated by rPA20 are related to apoptosis and cell growth. In addition, several cytokine related genes were up regulated by rPA20. This observation is consistent with the reported effect of B. anthracisin vitro and in vivo . A recent publication using modeling approaches identified a 14 kDa sequence (14–150) as a critically conserved domain in bacterial toxins, adhesins other crucial molecules for biological activity . It should be noted that this study was a survey of sequences using bioinformatics and modeling and did not utilize an actual fragment from PA.
Another interesting observation is the effect of rPA20 on the expression of CD38 that was significantly decreased by rPA20. CD38 is a type II integral membrane receptor and adhesion molecule  and serves as a cytotoxic triggering molecule on natural killer cells . Components of the Fas pathway were up regulated in PBMC treated with rPA20. We have also found that rPA20 increased the caspase-3 activity in PBMC cells. Thus we expected that rPA20 may induce apoptosis in these cells. The accepted model of PA63/LF complex and the deleterious effects attributed to this complex have not taken into consideration any possible effects of the rPA20 which is released when the complex is formed. Here we propose that rPA20 may be responsible for some of the effects previously ascribed to PA63/LF on host cells. A recent publication described the association of rPA20 with LF ; it is therefore possible that PA20 has additional functions which may contribute to pathogenesis and should be considered. The 20 kDa component of the protective antigen may play a role in the pathogenesis of Bacillus anthracis and should be studied in more details. Rasha Hammamieh and John Ezzell contributed equally to this work. We acknowledge Dr. Joseph Farchaus for his guidance in the preparation of Factor Xa PA.
RH drafted the manuscript, performed the genomic analysis, data mining and the apoptosis studies. WJR carried out the production, purification and characterization of the rPA20. TGA carried out the exposures to B. anthracis. MJ conceived of the study, and participated in its design and coordination. JWE participated in the design and coordination on the study. All authors read and approved the final manuscript.